Napoleon Bonaparte’s rise to power marked the death knell of the French Revolution. His autocratic government ended the attempts at increased democracy that had shaken the country for a decade. The situation was a terribly ironic one. 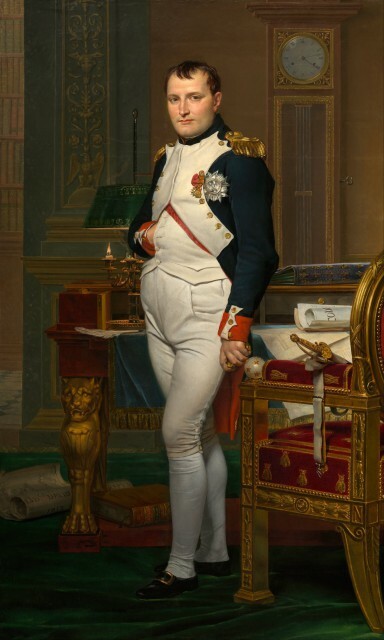 Napoleon never could have risen to power without the revolution he destroyed. Two great changes took place in the French army thanks to the revolution that began in 1789. The first of these, and the most important for Napoleon, was a transformation in the officer class. The French army of the Ancién Regime – the pre-revolutionary government – was deeply traditional. Since the Frankish empire of Charlemagne in the 8th century, it had been led by an aristocratic elite. Until the rise of gunpowder, they provided the army with shock troops in the form of heavily armored knights. By 1789 they were the officers. Because nearly all the officers were from aristocratic backgrounds, many of them opposed the transformations of the revolution. The lucky ones fled abroad, finding work in the armies of other European nations and plotting their return. The unlucky ones were executed in the revolutionary purges. The loss of so many officers created a void in the army, into which men of minor background such as Napoleon could rise. It also allowed skill to replace social status in deciding who would command the nation’s soldiers. Following the revolution, France quickly went to war with many of its neighbors. This happened for a mixture of reasons – fear of revolutionary principles among Europe’s elite; a French desire to spread those principles; opportunism, as other countries tried to gain advantage from France’s turmoil; and long standing political maneuvering on the continent. Finding themselves at war with half of Europe, the French introduced the first ever military conscription. Together with volunteers dedicated to the national revolutionary cause, this created a new sort of army. The troops were open to new ideas and new inspirations. In a time of instability, they were ready to latch onto a leader who would provide them with glory and security. Not everyone in France agreed with the revolution, and the new government fought several campaigns against counter-revolutionary forces in conservative parts of the country. This was where Napoleon first proved his ability as a commander. Put in charge of French artillery at the Siege of Toulon in July 1793, he came up with a plan to capture the city. Leading an assault against enemy positions, he was wounded in the thigh, but his plan continued to be followed by others. His tactical skill and heroism at Toulon won him fame and influential friends. He further proved his revolutionary credentials in October 1795, when royalists rose up in Paris. Placing large cannons at a key position in the city, Napoleon drove back the counter-revolutionaries. 1400 died and the rest fled. As historian Thomas Carlyle said, Napoleon cleared the streets “with a whiff of grapeshot”. One important front in the revolutionary wars was Italy. Long a place of struggle between France and Austria, it was there that Napoleon was sent once he had proved his worth as a defender of the revolution. 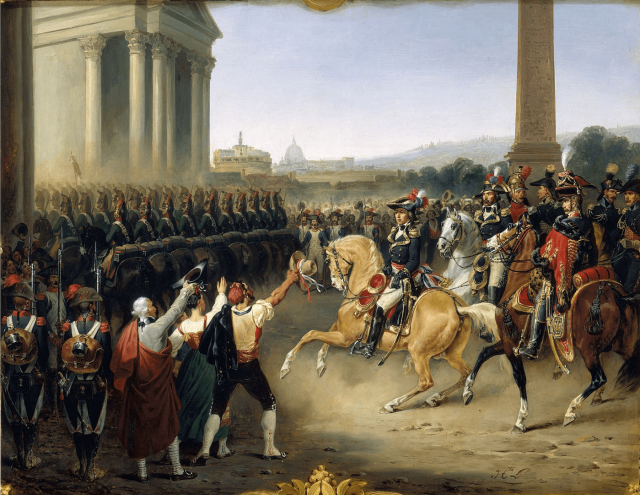 The Italian campaign was distinctly flavored by the French Revolution, and Napoleon used revolutionary tools to make it a success. He set up independent Italian republics as a sign of the revolutionary cause, a way of buying local loyalties, and a poke in the eye to the monarchic Austrians. This campaign was also the point at which Napoleon showed his true skill in using the revolutionary army and its increasingly professional officer corps. He consistently outmaneuvered the Italians, using concentration of force to beat them with a smaller army. His army won 18 pitched battles, capturing 150,000 prisoners, 540 cannons and 170 standards. 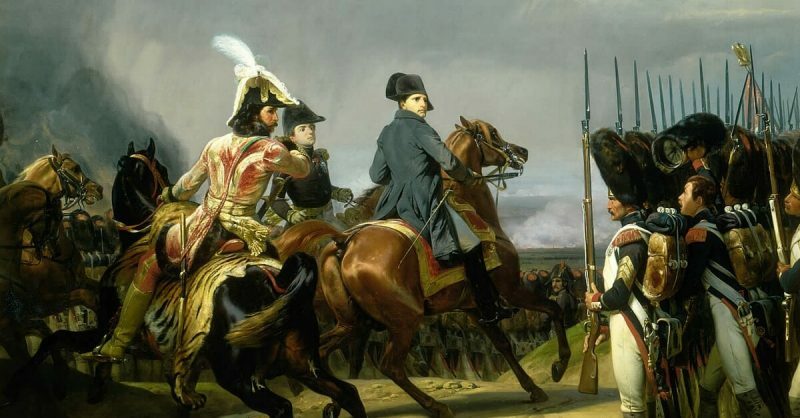 While international politics provided the wars that proved Napoleon’s skills as a leader, it was domestic politics that gave him the opportunity to seize power. The revolution did not create a single, stable government that ruled in place of the King. Instead it created a series of different systems and leaders, as factions fought for control of the country. The Constituent Assembly, National Convention and Directory all took their turns. Coups – both violent and bloodless, successful and unsuccessful – became a regular part of French politics. In this atmosphere, wily politicians were looking out for the next coup, or plotting their own. This was how Napoleon came to power as First Consul. Having won glory leading the army, he returned to Paris in 1799 from a failed Egyptian campaign, but was still a national hero. With a group of other politicians – including Talleyrand, one of the most infamous pragmatists and political survivors of the period – he took control of the country in the Coup of 18 Brumaire, named for its date in the revolutionary calendar. Napoleon’s family are mostly remembered as political figureheads, put in charge of the European states he conquered. But his brother Lucien was a politician in his own right. Like Napoleon, Lucien’s rise was made possible by the revolution. Travelling to Paris to take part in the exciting politics of 1789, he became a prominent member of the Jacobin Club, an influential home of radical politicians. He became president of the Council of Five Hundred, the lower house of the French legislature from 1795 to 1799. Lucien’s showmanship, courage and skills at spinning a situation were central to the Coup of 18 Brumaire, in which he was one of the lead conspirators. He galvanised grenadiers behind his brother’s cause, cementing the success of the coup. Following the coup, Lucien ensured that Napoleon was not just one of several consuls but was voted First Consul, a position of leadership that made him effective ruler of France. The revolution made the Napoleon brothers. They in turn tore it down. For more on the French Revolution and Napoleon’s rise to power, check out the Revolutions Podcast by Mike Duncan.